If you thought a parking garage on this site was illconcieved before, you are going to love this variance request. The flood control ordinance requires buildings be elevated above the 100 year flood level. Seems responsible. In addition, by having these requirements, the federal government will not blacklist Indianapolis residents when it comes time to pay off on flood insurance. The ordinance would have the proposed Broad Ripple parking garage built at 723 feet altitude, 2 feet above the base flood elevation of 721 feet. The variance asks that they be able to build the garage at 719.2 feet. Their rational is that the long debated and disputed levee along Central Canal will someday lower the base flood elevation to 718. They postulate that if they build the garage at 719 feet, it would be above the future flood elevation, not by 2 feet mind you, but above some future mark. Nonetheless, they are woefully below not only the building elevation currently required, but below the current flood elevation. Below is a topographical map of the parcel that I got from the City's website (I created the parcel outline and enhanced the topo contours elevation notations). As you can see, the entire site is below the flood level. The high point of 720 feet elevation, still one foot below the flood elevation, is about the center of the property. The petitioners claim that they will have exit holes for the garage portion of the building. But, most of the first floor is not parking, it is retail, a police substation, and space for a drive through bank. The petitioner has not addressed these uses and how avoiding floodproofing them will be beneficial. Again with this project, anyone seeking common sense will be disappointed. The garage should never have been approved for this location. The building will not even fit on the lot, and will actually extend into the public right of way. Now, despite their earlier assurances, the petitioner is trying to avoid floodproofing the building and avoid complying with a very sound ordinance meant to protect taxpayers from having to pay off on avoidable flood damage. They stand logic on its head by saying that SOMEDAY a levee will lower the flood level, and THEN their garage will only be one foot below the required elevation. This project is the very definition of insanity. On Monday night, the Council's Metro & Econ Devel Committee heard a number of interesting Proposals. One of those was Prop 66, approving the designation of the old North of South (now City Way) fleecing of the taxpayers extraordinaire as a 'Certified Technology Park'. So many things are brewing in my mind about this that I struggle to find a logical flow for all of them. So, this blog entry will have more of a staccato effect than I would prefer. Just a warning. Let's start with the downplay of the Council's role in this designation of No-So (City Way) as a CTP. It was said that the role of the Council is merely to allow the President of the Council to sign on the agreement. Balderdash. The Council is in fact, the only duly elected body that will review the CTP to determine if it is in the best interest of the public. All other signatures are of appointees who surely know which way the wind is blowing. Now, a CTP will allow the City to collect from the State, all new sales taxes and state income taxes that flow to the state from the development. In addition new county option income tax revenues that normally flow to Indianapolis City/County government, would instead flow to a fund specific for this development. Combined, these new state and local tax revenues, up to a maximum of $5 million, usually go to pay for infrastructure improvements in the immediate CTP area. With No-So, the proceeds will go to help pay for the financing costs associated with the $98 million in bonds the City floated to make the loan to the Buckingham Group for the project - the costs anyone would say should be the developer's responsibility to repay, not the taxpayers'. No mention was made Monday night regarding the anticipated split between sales tax and income tax revenues that would be generated in City Way. But, please note, the COIT revenue could be a good fraction of the money since the COIT tax rate is 1.62 %, or a full third of all non-federal income taxes paid by Marion County residents. No-So (City Way) is not a technology park. The plan put forth last year (see "North of South - Details of Proposed Deal", "No-So Field of Dreams - Lie And They Will Build It", "No-So Deal Worse Than Even I Thought", and "City Way - The Rebranding of North of South") called for a residential, retail development with a minor 30,000 square feet of office space (now only 10,000 square feet). Within that office space, the developer hoped to lure one wet lab. It was said back then, that this lone wet lab would qualify No-So for designation as a CTP. Well, I guess that plan fell through. The new scam is to define the CTP area as much larger than No-So's footprint, all while stating that only tax revenues from No-So (City Way) would be bundled. 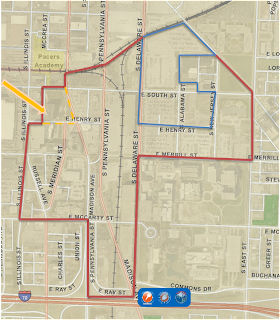 Below are the outlines of No-So (City Way) in blue and the outline of the rest of the CTP area in red. You will notice a gold arrow and a small area outlined with a dashed gold line. This is the Faris Building which will house the new offices of Rolls Royce - no new jobs were created, just relocated to this space from other parts of the County and Central Indiana. Rolls Royce is the only tech part of the CTP area. It will receive no value from the CTP designation, and like the rest of the CTP area beyond No-So (City Way), it will provide no revenue to the cause. It serves only as the legal underpinning for a CTP designation for No-So. In normal parlance, that is called a scam against the taxpayers of Indiana and Marion County. This matters because the CTP designation was created as a means to supplement the infrastructure improvements needed to attract high tech businesses to Indiana. No-So is just bilking that intention. It means that, like Prop 67 which was also discussed by the Committee on Monday night, two legitimate technology parks must share one CTP designation and split their $5 million in state sales tax, and income tax revenues for their infrastructure needs. So, the fake CTP gets a full $5 million, while two legitimate high tech ventures (Purdue Technology Park and Intech Park) must share a $5 million. Now how is that helping to attract high tech to Indiana? It is not. Before wrapping this entry up with the Committee vote, I also have to correct the numbers presented by the proponents of No-So (City Way). They continue to overstate the investment by the developer and Lilly, while understating the taxpayer's contribution to the development. They never did mention the allocation of risk being exclusively in the direction of the taxpayers, but I will. The developer must, at a minimum, secure a $6 million line of credit with a bank. That's all. Eli Lilly is touted as putting up about $30 million, but that does not hold up on any level of inspection. $15 million was from an unnecessarily early payment to Lilly for its part in a complex Harding Street TIF deal that benefited Lilly. The taxpayers paid Lilly the $15 million and Lilly gave the developer that money. The rest of Lilly's so called investment is the value of the land upon which No-So (City Way) is to be built. Yet, Lilly retains ownership and expects an undisclosed lease payment from the owners of No-So (City Way) year after year. Marion County taxpayers, however, floated $98 million in bonds and loaned $86 million to the developer, when a bank would not. The payback guarantee on the bonds is from the consolidated downtown TIF. In addition, all property taxes paid by the developer/owners of the development over the next 10 years, will be credited as their partial repayment of the loan. So, no property taxes will be paid on this property to the tax coffers of Indianapolis, nor to consolidated downtown TIF, but will be considered payment from the developer for the loan. This is estimated to be about $12 million. Add this to the $9 million in infrastructure improvements (the ONLY money acknowledged to be contributed by the taxpayers, mind you) and the $5 million from the CTP designation and taxpayers are into this project over $40 million. While the developer is required only to have a $6 million line of credit with a bank. But, the icing on the cake came when the final deal was revealed. For repayment of the loan, the project is segmented. The developer can default on one segment, while profiting on others. The risk is on the shoulders of Indianapolis taxpayers alone. If there is a default, the taxpayers will need to put in even more money to finish the project and more money to pay off the outstanding bonds. Now, on to the Committee vote. All Councillors on the committee voted for this boondoogle of a CTP designation, save one - Councillor Zach Adamson. Many thanks to Councillor Adamson for voting against this last fleecing of the taxpayers for the largest boondoggle of the many boondoggles of the Ballard Administration. The full Council will vote on this matter Monday night. Again, despite the downplay of the role of the Council in legalizing this CTP designation, the City-County Councillors are the only elected officials who will evaluate the appropriateness of granting the designation. This is a boondoggle, and a scam, and will do nothing to bring high tech jobs to Indianapolis. City-County Council Proposal 70 is absolutely what the taxpayers of Indianapolis need passed. Authored by Councillor Brian Mahern, it proposes that elementary issues about TIF districts be studied and more. It is so very important that our community engage in a conversation about TIFs as they have an immense impact on property tax rates, revenues available to our governmental units, and economic development in our City. Last year was a watershed year for interest in the topic by regular citizens. Now it is time to move that conversation forward. It must also be said that it is the responsibility of the Councillors to have an understanding of TIF districts because so much that comes before the Council on economic matters has an interplay with TIF districts and visa versa. How do abatements within a TIF district affect the ability to pay the bonds underlying the district? How many poorly performing TIFs do we have and how does that affect the promises made when the TIF was set up - for instance the promise that all of the tax revenues flowing to the schools and fire departments and library and IndyGo will continue to flow after the TIF is set up (a promise more often broken than kept is my guess). How long should a TIF exist - should it be retired as soon as possible, or should it be used as a long lived slush fund? 6) Need for performance goals for private development that receives TIF and methods to provide consequences for the failure to achieve those goals. 10) Need to establish methods to dismantle TIF districts that are no longer needed and/or address projects therein that are not achieving economic development goals. (8) a member of the Indiana General Assembly, to be appointed by the Council president. Preliminary findings would be reported back to the Council by April 30. I cannot endorse this Proposal more strongly than I do. Councillor Mahern has put together a well thought out plan of inquiry that can only improve our understanding of the real ability of TIFs to impact economic development and at the same time establish safeguards that will help protect the public from misuse of these complex tools. This week's Fundy goes to the staff of Current Planning. I would have mentioned them for the first award had an important zoning matter not been pending. Now that is behind us, I am happy to extol the high standards of open government these folks set for all the rest. There should be some clever, Dr. Suessian rhyme perhaps, to list the ways you can easily obtain documents from the good folks at Current Planning. Show up in person, unannounced, and request a file or even any information they have about a particular address. Email them. Phone them. During the times I worked on the voting records of the MDC and BZAs, I was welcomed to use their computer system to fill in my spreadsheets. Never has there been any hesitation and the only delays have been those necessary to locate some of the older, dusty files. I hesitate to begin listing names, as there are so many and I hate to miss anyone... but, here goes. Let's start with the Secretaries to the Commission and Boards - Heather Stephan and Emily Holmes. Ann Able and her staff. Larry Williams and his staff - David Hittle, Jeff York, Melanie Mullens and Alex Sulanke. I know every neighborhood leader will agree that these professionals outshine everyone else when it comes to public access. Finally I wind back to the proposed Fast Park & Relax project itself, and how it all ties in. As I mentioned a few posts ago, this is not your typical parking lot that serves the flying public. It is a very green project that leads the way for others to follow. There will be canopies covering every parking space. This alone protects the vehicles from snow in the winter and sun in the summer, providing a convenience for the owner. From an environmental point of view, the canopies protect the land from the 'heat island effect', which raises ambient temperatures. Nearly all lights will be suspended from the underside of these canopies, minimizing light spillage into the night sky and toward nearby homes. Atop the canopies will be solar panels; the electricity generated will go to the operation. Additionally, rainwater is recycled for use on the landscaping. The master drainage for the area is already engineered and will accept the remaining water - as Indiana is graced with fairly dependable rainfall. The landscaping will be 4 times the depth required by ordinance so as to make the facility as appealing as possible. The shuttles run on alternative fuels and there will be electric charging stations in the future. All of these things are good examples of how green a business can be when the owners value such things. Perhaps the Airport, which is rightly proud of its LEED certification of the new terminal, could look these measures over to see which they might want to emulate in their parking lots. This green approach is a good fit with the efforts Ameriplex has put forth over the years. Also important is the fact that this project would be outside of the Airport/United TIF and would not seek tax abatements. It is estimated that the project would generate about $450,000 per year in taxes. That may not be much for downtown, but it certainly helps fill Decatur's bucket, which saw about $21 million in property tax collections from real property in 2011. It helps soften the tax cap impact, as well, by slightly lowering the tax rates. Not discussed here yet, but of great importance is how this project helps counteract some of the 'lack of rooftops' problem Decatur has. By attracting vehicles to the site, they will import visitors to Decatur. Already Ameriplex has seen interest in locating modest retail in the next block; gas station/convenience store and restaurants. Again, anywhere else in the County, this would evoke considerable yawning. But, here in Decatur it adds significantly to our amenities. These amenities should help the Purdue Research Park attract more high tech startups - startups who are interested in what the area can offer their employees. They also will help provide Decatur residents with more leisure options - options that are sorely lacking. This is not the end of our transition from rural to suburban, but it will definitely help. This facility is innovative in this market, and is an excellent fit with the strengths and challenges facing Decatur Township. Our community was won over and we showed up to the MDC hearing as proof of that. We are elated that so many Councillors stood with us and that the MDC approved the project. To my readers, thanks for your indulgence as I laid all of these pieces of the puzzle out over these last few posts. The stories of neighborhoods around the County are all unique, but we share themes. Now you know better the prospective from which I view the issues we all face. Someone with far better business acumen than I should do a case study of Ameriplex. The folks who run it have come up with some fantastic business models, only some of which have come to fruition. Here is the view from where I sit. I already mentioned ("The 800 Pound Gorilla - Indianapolis Airport") how the prime Interstate-70 frontage was taken from the Industrial Park before it even had legs under it, through the forced land swap with the Airport to ensure a 3rd runway for the exclusive use of FedEx. The Airport would swap prime interstate frontage for land it purchased through its noise abatement program - some land already purchased and some waiting for the property owner to decide it was the right time for him or her to sell to the program. The first interesting, to my eye, aspect of Ameriplex was its zoning. 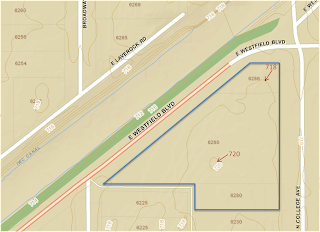 How do you zone for a 1200 acre industrial park when you do not know exactly where the Feds will locate a key I-70 interchange that will lead the bulk of traffic to your site, nor the exact parcels that will ultimately be purchased and when they will become available. For my fellow zoning geeks out there, the choice was a CS, where the first land use map was secured along with a process to move the lines between land uses through an administrative approval. Land that Ameriplex actually owned was zoned and the expected full built out footprint was assigned conceptual land uses to guide future zonings as those parcels were actually acquired. Flexibility had to be a component. Not just the routine flexibility for future uses sought by many petitioners on smaller tracts of land, but the flexibility to move land uses once it was know exactly where key infrastructure would be located. Ameriplex's first, and lasting, signature attribute was its environmental compatibility model. The idea was to use native plantings that would require little use of fertilizers and lower ongoing maintenance. The benefits would be a nice looking property along with lower costs for the land owners within the Park. This was a bit of a bumpy road for the first few years as perennial wildflower plantings do take some time to overtake other 'native' plants that are considered mere weeds. Ultimately a mix of native plantings and traditional mowed lawn yards prevailed. Walking trails, a winding creek that runs through the north end of the Park, and deliberate preservation of existing woods, all help set Ameriplex slightly apart. For their efforts on this front Ameriplex was awarded the first certification as a Wildlife-Friendly Development from the Indiana Wildlife Federation for "promoting the preservation, enhancement and restoration of wildlife habitat throughout the planning and construction process". 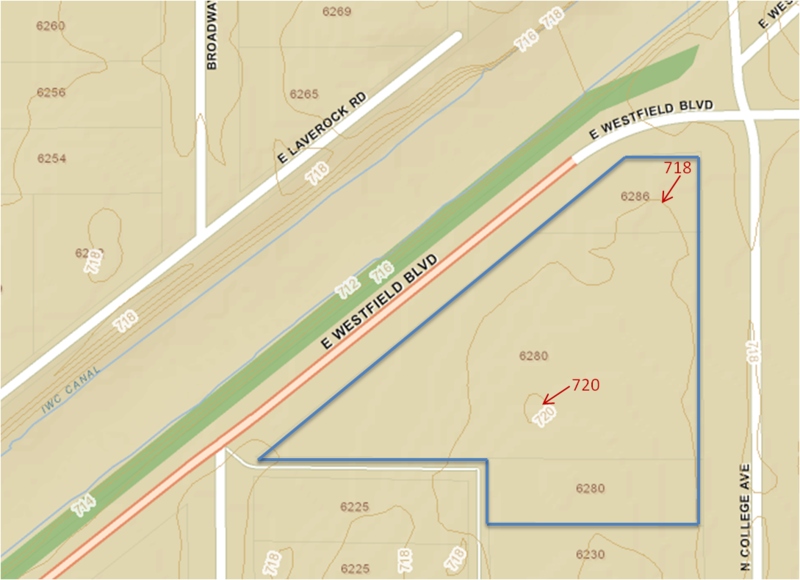 The most exciting business model postulated by the Ameriplex folks (Chris Wilkes runs the Park and its development here in Indy, but his partners in the overall effort are Doug Hunt and John Phair who oversee their Industrial Parks elsewhere) was 70 West. It was designed for the area closest to the I-70 / Amerplex Parkway interchange and utilized the I-70 frontage that Ameriplex was able to retain after the land swap with the Airport. The idea was to locate big players in the 'destination retail' market. These are retailers, whose customer base is not local rooftops measured in a mile or two radius, but those within a three hour travel time. This would by the types of retail epitomized by Ikea, Bass Pro-Shop, and Cabela's. The fit was excellent. With the airport next door, that three hour travel time need not be by car. For Decatur, it could attract the retail we need without us having to provide the rooftops. The project needed State assistance, since the City was not going to help finance the project. The destination retailers are used to regions vying for their business with incentives. Ameriplex hoped to get the State to agree to an additional increment of sales tax just within the project to pay for the incentives. It was not to be. Decaturites tried to help, but we were not effective enough. I remember being on the phone with Gordon Hendry, Mayor Peterson's economic development guy, as I headed to the hearing in the Statehouse. Hendry was pulling the plug and Peterson's support for the project was not going to be expressed before the committee. That is when Representative Phil Hinkle stepped in to aide our community - for which I am eternally grateful. He threatened to kill legislation Peterson wanted on abandoned houses. Peterson let the abandoned housing bill get killed rather than help us. Just like this year with mass transit, if the local politicians don't pull the wagon, why should Legislators from the rest of the State vote for something exciting in Indy. Fast forward to a couple of years ago, Purdue Foundation and Ameriplex got together to install a business incubator for cutting edge companies - the Purdue Research Park in Ameriplex. The idea here was to locate the incubator facility in an area where the successfully incubated companies could spin out to nearby parcels, maintaining their relationships with the incubator staff. This research lab concept to fully developed product Technology Park is very exciting for all of Indianapolis, but certainly fantastic as a vehicle to provide high tech jobs for Decatur residents. Next time I'll talk about the proposed Fast Park & Relax facility that was the subject of the recent zoning and the focus of so much drama. Hopefully the pieces are coming together as to how this project fits with the environmental stewardship efforts of Ameriplex, fills some of the needs for Decatur's taxbase outside of the TIF district and more. Like all neighborhoods of Marion County, Decatur Township has a unique blend of opportunities and challenges. I have spoken to a number of neighborhood leaders throughout Indianapolis over the years, and almost all feel that their neighborhood is last on the City's list to be provided a leg up or assistance or much help dealing with their issues. I conclude all are right. If you are not downtown, you ARE last. Unigov ensured that the resources of the non-downtown communities would be pooled to benefit downtown. We all cover the cost of their City services, while their property tax revenues are spent on more benefits for downtown and favored developers. Decatur has about 30,000 people. Our Township is the smallest geographically; the eastern border follows the White River and not the same north-south dividing line used by other Townships. The airport takes up at least 10 % of our land (latest info I have is from 1988, but that number would only have grown). Our infrastructure, roads and sewers, have limited points of entry into our Township, unlike the other 8 Townships in the County. The White River and the Airport substantially block access, and the areas of Hendricks and Morgan County that abut are largely farmlands with little infrastructure of their own. There are only two roads over the White River, and no sewer crossings. So, our development from farming to more intense land uses flows mostly from the north. Within I-465 we are pretty well all developed, with older homes, a small strip center, two grocery stores, two pharmacies, and a few fast food joints. Outside I-465 is older subdivisions generally to the north, spreading to newer subdivisions and a great deal of remaining farmland to the south. Little to no retail is located outside of I-465. There is a railroad track running the length of Kentucky Avenue that has a huge impact on our land use patterns. Unlike other areas where it makes sense to have commercial nodes surrounded by residential uses, we are more laminar. The existence of the airport dictates that few residences remain north of Kentucky Avenue outside of I-465. The existence of the railroad dictates that when retail uses finally come in, they will mostly be located on the south side of Kentucky Avenue. The remaining land is needed for homes. Decatur has had a terrible time attracting retail. This is somewhat due to our low population, but more notably due to the lack of rooftops on so much of Decatur land either occupied by the airport or anywhere near the airport. This condition runs into Hendricks County as well. When national chains do their analysis of market potential, they find no more than half the 360 degree view can ever be filled with the homes of customers, much less filled now. This lack of retail is a chicken and egg thing. Without the amenities of convenient shopping, many potential homeowners look elsewhere to live. Decatur has only a tiny stock of move-up homes. Just to round out the issues we face, we have mining at the north end, with Martin-Marietta blasting underground beneath the Southside Landfill that straddles the Wayne/Decatur line, and American Aggregates blasting and strip mining across the White River in Perry Township. We have had no success engaging Mayor Ballard in the ill effects to our northern neighborhoods from the blasting and constant dust. We have few sidewalks, few streetlights, a lot of septic tanks and wells. We have one IndyGo bus route that reaches down as far as Ameriplex and returns to the north. We are the only Township without a City Park's pool. We have nothing to entertain the youth of the Township beyond school sponsored activities; no movie theaters, no bowling alleys, no skating rinks. We have no bookstore, no place to buy a new shirt or new shoes. We have two sit-down restaurants that bring you a menu; a Denny's and an El Rodeo. We do have two golf courses, though; Buffer Park on the northeast and Winding River on the southeast. And, through the combined efforts of our Lions Club and 4-H, we host the State's largest annual Township Fair. Looking back through the Decatur history that I am aware of, it seems that what we do have are great people who have created the progress that we have enjoyed. When Goldsmith turned a deaf ear to Hi-Acre Manor over the absolute need for a levee to protect their homes from the White River, the neighbors banded together and built their own. Once a really bad zoning request had been defeated, the community banded together to raise the money to buy that property and add it to Southwestway Park. And currently ongoing, the community is banding together yet again, to fund the Goodwin Center that focuses on Head Start and a much needed Senior Center. Also to be noted in that list of accomplishments by the people who live in Decatur, is the existence of Ameriplex itself. As I mentioned in the last post ("The 800 Pound Gorilla - Indianapolis Airport"), our Civic leaders hoped to create an industrial park to provide a catalyst for growth throughout Decatur. It is a point of immense personal pride that I am part of the Decatur Township Civic Council, with its legacy of always trying to move Decatur forward. Back in 1993, leaders of the Civic Council, including Bob Cockrum, Betty Montgomery, and Ken Bartlett undertook a study of the effects of an industrial park, the United deal, a third runway, and the TIF district on our Township's development and its taxbase. They were not successful in staving off the ill effects of the Airport/United TIF, nor the airport's land grab to ensure a future 3rd runway totally in Decatur for exclusive use by FedEx. But, they were successful in helping to get an interchange on I-70 and the establishment of Ameriplex itself. I have lived in the heart of a big city. And it was great. I have lived in Decatur Township for the past 25 years now, and I find it equally great. We have the best of all worlds (outside of access to retail) - the relaxing atmosphere of a semi-rural semi-suburban lifestyle that is 20 minutes from downtown. And the people of Decatur cannot be beat. Central Indiana certainly needs a goodly sized airport. There are attendant difficulties forced on those in Decatur and Wayne Township, Marion County, that are necessary for an airport to exist. We understand that, and by and large accept the burden placed on us for the greater good. However, I have always felt that the burden placed on Wayne, Decatur and parts of Hendricks County, should be limited to only the burden that is absolutely necessary. In a future entry I will detail how, in recent years, the Airport has moved beyond what is necessary and now wishes to impose unnecessary hardship, not only on our side of town, but to a real extent, all over Marion County. But, for this entry, I want to focus on the impact of Airport operations on Decatur and Wayne Townships. I am not familiar with the ins and outs of impacts on neighboring Hendricks County, but assume their story will be similar. And, of course, I know far more about the details of Decatur's issues than those of Wayne. Long story short, assume as you read this, that the burden on Wayne Township is quite similar to that on Decatur, but I will have fewer exact details as to where those impacts are located precisely. The Indianapolis Airport grew over the decades to what we see today - a 7700 acre government run aviation operation that includes land actually used for aviation purposes, banked land for future expansion, and accumulated land not needed for aviation purposes. In the late '80s, the Airport instituted a residential buyout program for single family homes that fell within certain noise contours of the airport that were deemed by the FAA as imposing too much of a burden on the families that resided there. The FAA finances these purchases, they do not come out of Indianapolis' operating funds. The Airport uses actual noise monitor readings and computer projections to establish the noise conture lines. Those homes within a calculated decibel contour line are automatically able to participate in the guaranteed purchase program. Nobody is forced to sell, but when they are ready to do so, they have a willing buyer. I have never heard anyone complain about the purchase price that the airport offered for a home in this program. Land uses around the Airport and within the noise abatement program areas, may not include single family residential uses. Any other use is not prohibited, although building height restrictions are imposed, with the height limit dropping as you get closer to the end of a runway. For a number of years in the late 80's and early to mid-90's, Decatur Township saw its population and total assessed value actually drop due to the purchase of so many of our homes and the property's removal from the tax rolls. I am trying to locate more recent data, but what I can tell you is that between 1972 and 1988, the Airport grew from 1200 Decatur acres to 2150, consuming over 10% of our Township land area. And that was just before the big buying spree from the noise abatement program. Ever since that buyout program, there has been a continual tug of war with the Airport to return land to the tax rolls. The Airport was stubborn back then, but not totally unyielding - unlike today when I am not sure they give any thought to what is in the best interest of the surrounding community. The mid 90's saw the now infamous $300 million United Airlines Maintenance Facility built on the north side of the Airport, in Wayne Township. At the same time, to pay for Indy's portion of the costs ($100 million), extraordinarily large land areas of Decatur and Wayne were established as TIF areas. I have uploaded a scan of the different areas that comprise the consolidated Airport TIF. The dashed line running on the north side of TIF area 241 is the Township line dividing Wayne and Decatur Townships. Thousands upon thousands of acres of Wayne and Decatur Township have been siphoned off to pay for Airport debt for the United deal. When you hear Airport officials talk about how they do not take property taxes, please remember all of the property taxes being contributed to their TIF to pay for their United debt. Almost all of the land mass of Ameriplex Industrial Park lies within one or another of these Airport TIFs. Almost all of the existing buildout of Ameriplex is within the TIF. After all of these years, we finally have two hotels, one warehouse, and the corner of another that are outside the TIF and contribute taxes to our school district and Township government. Because we have few businesses outside the TIF, our tax base is skewed to the homeowners of Decatur. Ameriplex was envisioned by Civic leaders in Decatur in the late 80s and early 90s. It was hoped that, like Pike Township had done with Park 100, building an industrial park would help our Township grow and prosper. There were 1100 acres along the south side of I-70 that were then being used for farming. The frontage would have the type of exposure sought by business headquarters. But as plans developed for Ameriplex, the Airport and then Mayor Goldsmith forced a land swap. The prime frontage would have to be sacrificed to the Airport so they could land bank 100s of acres for a future 3rd parallel runway - for the anticipated exclusive use of FedEx. The Airport would bundle the property it had been buying through the noise abatement program and swap it to form the current Ameriplex outline. So, withing a 10 year period, Decatur lost population and property to the Airport through the noise abatement program, was hobbled by the establishment of the Airport/United TIF that utilized Township services but did not contribute property taxes to cover the costs, and forced to accede to a land swap that simultaneously guaranteed further future intrusion by a 3rd runway and a downgrade to the prime real estate location for Ameriplex. Planned for some years, a new midfield terminal opened in 2008 on the west end of the Airport proper, within Decatur Township. The facility is reported to be 1.2 million square feet and cost almost $1 billion to build. The public was told, prior to the decision to build the new terminal, that airline landing and docking fees would cover the debt service on the bonds. The Airport Authority is backing down from that promise so that they can charge the airlines lower fees. Meanwhile, the old terminal, parking lots and car rental lots on the east end of the Airport, stand idle and unkempt. The Airport is not planning on turning any of these hundreds of acres back to the tax rolls, where they would do Wayne Township some good. Instead, the Airport has grandiose plans to help itself to revenue from that property, even though it is no longer useful for aviation or aviation support. This should be recieving far more scrutiny by the public and government officials than it has. I will elaborate on this issue in the near future. Quite candidly, I have not been blogging for the past week because of the pending zoning hearing that was held yesterday for 2.5 - 3 hours. It was all I wanted to talk about, but I did not want to jeopardize the ultimate outcome by posting. That outcome was too important to my community. But, now that it is over, I will lay out all of the strangeness that latched on to what should have been a dull and routine rezoning of 15 acres of land. Readers of this blog will recognize that the themes that permeate this rezoning spectacle are exactly the themes I bring up all the time - TIF districts, taxes, government overreach, and public input into the decisions made by government. I think once you hear the full extent of what culminated in yesterday's hearing, you will agree that liberal or conservative, there are things we can all agree are appropriate actions of government and things we can all agree are inappropriate. I am going to break this up over several blog entries, as I do not want to rush through the important pieces of the puzzle, nor to I want to impose on my readers a thesis length single blog entry trying to cover it all. For today, I will hit the peaks, then tomorrow and after I'll look at each mountain. First of all, here are some links to excellent reporting by Mary Milz of Channel 13 and Anthony Schoettle of the IBJ. I will also add a link to the WCTY, government channel, archive of yesterday's hearing once it is posted. Second, I want to thank the Commissioners for siding with the community by a vote of 6-2. I want to thank Councillors Jason Holiday (our district Councillor), Bob Lutz (whose district takes in the north side of the airport), and Zach Adamson (one of our At-Large Councillors) for taking the time to come downtown and speak out in support. A thanks also goes to Councillors Steve Talley and Jeff Cardwell for sending in letters of support. Last but not least, a stout and hardy thank you goes out to all of my fellow Decaturites and other supporters who attended the hearing. Our butts may have become numb during the hours of the prolonged hearing, but the impact of visible community support cannot be overestimated. Ameriplex is a 1200 acre industrial park here in Decatur. The airport and I-70 abut it to the north. It extends in places to Kentucky Avenue with carve-outs of several abutting neighborhoods. There are also hundreds of acres south of I-70 held by the airport for a future runway that make the outline of Ameriplex strangely angled on the northern perimeter as well. (I uploaded a land use map of the park to Google docs - click here). The vast majority of the park and the vast majority of the current development is in the TIF district set up for the long gone United Maintenance deal at the airport. This TIF district continues to be problematic for the Decatur community. Ameriplex wanted to locate a park and fly facility on a 30 acre block within Ameriplex that was convenient to the traveling public at the first stoplight south of the I-70/Ameriplex Parkway interchange. 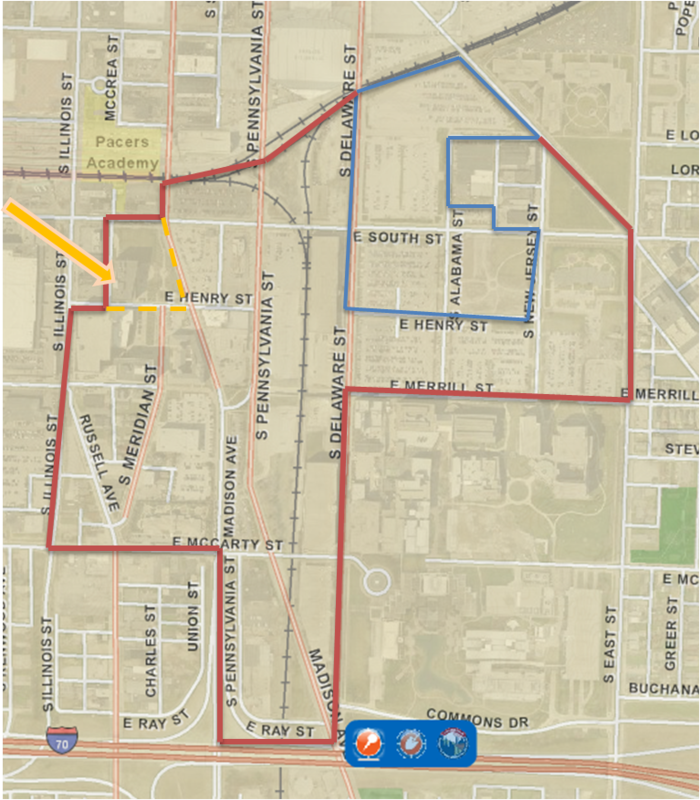 This area is also outside of the TIF district and there would be no tax abatement sought for the project. Now, everyone I have talked to had the same reaction I did upon hearing this news. "Oh, really? I don't like that one bit". But, once you listened to what was being proposed, you changed your mind (or 90% of the people did). This was to be a Fast Park & Relax facility. This is a family business with off-airport parking at a dozen airports around the Country. They are not typical of this genre. They are environmentally progressive - with canopies over every parking spot; lights hanging from the under side and solar panels atop. They capture rainwater and reuse it on site. They insist on ample landscaping and screening. Their shuttles run on alternative energy. This green approach is instructive in that it demonstrates that when something is important to you, not only can you make it work, you can build a thriving business at the same time. The block chosen was of mixed zoning uses - half would allow the Fast Park and half would not. So, Ameriplex sought the zoning change. Enter the Plainfield Park Fly & Ride off-airport facility, otherwise called the "Indy Park Fly & Ride". This is part of a network of 50 off-airport parking facilities around the Country. They hired a lawyer to derail the zoning. At the eleventh hour who enters but the 800 pound gorilla known as the Indianapolis International Airport, who decides that it does not like having another competitor for the parking business it runs. Mayor Ballard agrees and joins them in their opposition. All Marion County residents should be alarmed at what the Indy Airport is up to. I have blogged on it before and I'll go into it again later, but the Airport, which touts itself as an economic engine, has morphed into a tax-free business entity whose business model will bring much harm to legitimate private sector development and competition. In an ironic twist, by trying to kill off zoning for a private, reasonably located business enterprise on private property, they may have helped illuminate just what they really are now all about. The hearing yesterday should have been about land use for 15 acres of a 1200 acre industrial park on the southwest corner of Marion County. While that was noted, the hearing was really about whether or not a private company and a governmental unit should be allowed to keep out another private competitor simply because the did not want that competition eating into their bottom line. The meeting was run quite well by Chairman Tim Ping. Although he did not vote with us, he did allow all of the points to be thrown out onto the table. The information did not flow in a linear fashion, but I do believe it all got out. On the side trying to kill the project was the Airport, represented by Bob Duncan, former Attorney for the Airport as well as its former Executive Director, the Mayor's Office, represented by Mike Huber, Deputy Director for Economic Development (quite the misnomer yesterday), and Indy (really Plainfield) Park Ride & Fly, represented by attorney Brian Tuohy. About a dozen Decatur residents attended, who represent the 10% of the nearby homeowners opposed to the project. On our side we had Ameriplex and Fast Park, represented by attorney Murray Clark, and the huge support of 5 Councillors (Holiday, Lutz, Adamson, Talley, and Cardwell) who provided an important counter balance to the weight of the Airport and Mayor's Office. I'd guess about 45 or more Decaturites who support the project attended. At least half were residents of the nearest neighborhood and they represented the 90% who live in the area and support the project. Not insignificant to me, we had the support of the Decatur Township Civic Council and the Marion County Alliance of Neighborhood Associations. The vote of the Commission was 6 - 2 to approve the rezoning. That was a resounding affirmation that the Airport should not be able to limit private enterprise simply because the Airport would prefer not to have competition. It was a fair result and an important result for Decatur Township. More on the individual pieces of this story as the days go on. By all accounts, Indy's hosting of the Super Bowl has been a fantastic success for Indianapolis and its image. I want to be sure to acknowledge the 8000 volunteers who, as usual in Indy, helped put our best foot forward. Much must be said in coming days about things spinning out of the Super Bowl, but we should enjoy the positive buzz created by the smooth operation of the downtown event . I have a couple of commitments running right now that will make posting sporadic. But, I did want to jump in and congratulate everyone involved in Indy's success. The assignment of Councillors to committee has some 'winners' and 'losers' on the Democrat side of the aisle, and a more homogeneous distribution on the Republican side. There are 11 committees with 51 D positions and 30 R positions available. Given 16 Ds and 13 Rs, that calculates to an average of 3.2 committees per D and 2.3 committees per R.
Here are the Councillors, listed by the number of committees to which they have been assigned. An asterisk after the committee denotes that Councillor serves as Chair. Councillor Evans is the only incumbent D who did not get to Chair a committee, while President Lewis Chairs 2 and Councillor Brown Chairs 3. Additionally, during the Rules committee meeting where 4 committees were combined to create 2 committees and 1 new committee was revived from a few years ago, much was made of saving taxpayers money. The 2011 committees provided 84 seats, while the 2012 committees provide 81. Not much cost savings really, especially given that when budget time rolls around the 2 combined committees will have to meet the same number of times as the original 4 did last year. The State Legislature that once tried to legally redefine the area of a circle and require pi be rounded off has again demonstrated its ignorance by passing out of one chamber, a bill that would equate creationism with science. Yes, Indiana's motto surely must be "Indiana - Giving Arkansas a Run for its Money". Try attracting science and technology companies, those companies that make billions clinging to the tenets of actual science, to a state that screams "we are science illiterate and we are proud of that fact". Meanwhile, both chambers have passed, and the Governor who wants to be Vice-President has signed, a bill making Indiana the 23rd so called right to work state. It is shear nonsense that Indiana will attract more companies by this means. Plain and simple, this is a union busting measure. I would suggest that any person who opts to not pay union dues, be forced to forfeit the collective bargaining muscle of the union members and forgo the grievance process afforded by working in a union shop. Fair is fair. No dues - no services. Adding to the triumph of the 18th century over anything modern, the Legislature has kicked a mass transit bill to the curb yet again. Watch out Arkansas, Indiana's on the move. Wireless communication is nearly universal. When should such communication be considered public record, even when the service and device are not paid for by the taxpayers? Email addresses with the indy.gov domain name are available to all 29 City-County Councillors. A review of the Councillor contact webpage shows, however, that only 7 Councillors use it as their suggested email contact for constituents. Those would be lone Republican, Bob Lutz, and Democrats Zach Adamson, LeRoy Robinson, Monroe Gray, Maggie Lewis, Frank Mascari, and William Oliver. Since the taxpayers are providing those email addresses, they are subject to open records laws. Presumably, the personal, non-governmental email addresses used by the remaining Councillors, as well as the personal accounts of those 7, are off limits to the public. Just when, though, should Councillor electronic communications be considered open to public perusal? I would suggest that when an electronic or wireless device is used during a public meeting of the Council or one of its committees, then the transmissions should be considered part of the public record of that meeting. Some Councillors use laptops, some text, some gather email through their cell phones during public meetings. The Councillors, by the way, are elected to attend to the public's business at these meetings, and are also paid to do so. Information conveyed to a Councillor can be personal, but it could easily be anything from testimony, to instructions from 'higher ups' on how to vote, to virtual caucus meetings held simultaneously with the in-person meeting. Since these communications can weigh into the Councillor's voting decisions, they should be disclosable to the public as such. That can only mean that they should be open records and comply with open meeting laws, and therefore subject to inquiry by a member of the public.